Mile High Baby: Peter Ambrose is 3 Months Old Today! 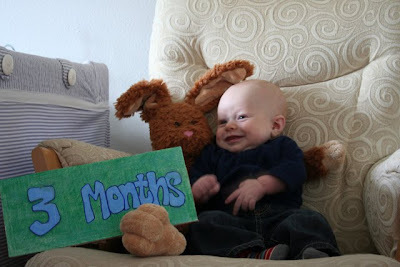 Peter Ambrose is 3 Months Old Today! What a fun month! Though he's only just completed the so-called "4th trimester," he seems less and less like a baby and more like a little boy to us. And of course, he is "talking" and smiling more and more, making for some truly precious and memorable moments. As of today, he weighs 12 pounds, 15 ounces. Peter Ambrose and Mommy have also enjoyed having play dates with other Moms and babies. Friends are the best!! Happy 3-month Birthday, sweet boy! We love you so very much, more and more as the months pass. Splish splash! We love to swim! A few firsts... Can you guess what they are?